There are many drastic changes coming to iPhone 8 & iPhone X, one of which is that you can play HEVC video on iPhone 8/8 Plus and premium version iPhone X thanks to the support for HEVC/H.265 in iOS 11. But you are kidding yourself if you think that you can play all the HEVC encoded videos on iPhone 8/8 Plus, say, MKV video file using HEVC codec. You'll run into a need to convert video to iPhone 8 supported formats at times. For example, you downloaded some 100MB HEVC MKV movies that refused to play on iPhone 8. Or you have many online videos formatted FLV unaccepted by iPhone 8. Or you switched from a Android phone to iPhone 8/iPhone X, and you have a number of WMV/AVI videos on the old Android phone and need to transfer to iPhone 8. Follow our top two ways to quickly convert video to iPhone 8 for free. As the first iPhone video converter that add preset for iPhone XS/XR/8/8 Plus/X, MacX Video Converter Pro makes it easy to convert video to iPhone 8 and iPhone X. What's more, it's super fast and has the widest codec/container format support. Look at some of the main features below. • Convert video of MKV, AVI, WMV, FLV, HEVC, H.264 and tons of other video codecs, container formats to iPhone 8/X compatible MOV, M4V, MP4. • Convert and compress VR videos, 8K/4K video to 1080p, 1080p to 720p to save more storage space for iPhone X/8/8 Plus/7s/7/6s/6/SE/5s. • Support for QSV hardware acceleration, HT tech, Multi-core CPU processing, convert video to iPhone 8 with at least 5x faster speed than Handbrake. • Free download HEVC, MP4, MOV etc. videos movies to iPhone XS/XR/8/8 Plus/X/7/6s/6/SE/5s from YouTube, crunchyroll, Vimeo, Dailymotion 300+ sites. Step 1: Download the best free iPhone 8 video converter for Mac or for PC, and run it on your computer. Click Video button on the top left corner, select source video you'd like to convert from the window, and the video will be loaded quickly. Step 2: Choose output format for iPhone 8 or iPhone X. 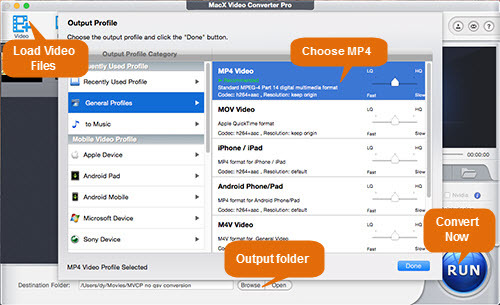 On the Output Profile window, select iPhone 8 accepted video formats, such as MP4, MOV, M4V. Or go to Apple Device > to iPhone Video, and select iPhone 8 Plus/X (H.264) or others. Step 3: Click "RUN" to start to convert video to iPhone 8. The time it takes to finish the process also depends on the source video file size. After the conversion job is finished, transfer the video to iPhone 8/8 Plus on Mac or PC. With the video converter for iPhone 8, you can also download movies to iPhone 8 from 300+ legal free movie sites, and download free music to iPhone 8 from Audiomack, YouTube, Vevo, Dailymotion, and more MP3 MP4 music sites in batch. If you have no idea of what format and video spec to choose from when converting video to iPhone 8, check our list of iPhone 8 supported video formats. H.265 video up to 4K, 30fps, High Profile level 4.2 with AAC-LC audio up to 160kbps, 48kHz, stereo audio or Dolby Audio up to 1008kbps, 48kHz, in .m4v, .mp4, and .mov file formats. H.264 video up to 4K, 30FPS, in .m4v, .mp4, and .mov file formats. MPEG-4 video up to 2.5Mbps, 640x480, 30fps, in .m4v, .mp4, and .mov file formats. Motion JPEG (M-JPEG) video up to 35Mbps, 1280x720, 30fps, in .avi file format. The iPhone 8 video converter we introduce above allows you to convert video frame rate for iPhone, compress video size, change video resolution, modify video audio parameters, rotate iPhone video, edit HEVC 4K video recorded on iPhone 8/iPhone X, to name just a few. Some solid iPhone 8 transfer tools can convert video to iPhone X and iPhone 8 supported video format when syncing them to device. MacX MediaTrans is one of them, which enables users to convert and transfer video of MKV, AVI, WMV, FLV etc. to iPhone 8/Plus at a stroke. • With a built-in video converter, it auto converts MKV, AVI, WMV, FLV etc. to iPhone accepted format MP4 in a flash. • Remove DRM from iTunes purchases, movies, TV shows, and convert to DRM-free format for unlimited sharing and playback. • Transfer video to iPhone 8/8 Plus and other iPhone models, iPad, iPod Touch in a click without iTunes syncing. • Offer two-way to transfer video, music, photos, books, podcast, DRM content, documents and tons of other data between iPhone, iPad, iPod and computer. • Manage iPhone 8/8 Plus data easily and efficiently, for instance, delete files, edit music playlists, make ringtones, and more. Step 1: Run the best free iPhone 8 video converter and transfer tool on your computer, plug your iPhone 8/X in. Make sure you are using the latest version of the software. Step 2: Click Video button, and then click Add video on top of the Video window, select videos from your computer and prep to convert them to iPhone 8 or iPhone X. Step 3: You'll see the message "unsupported format" if you throw any incompatible videos to the free video converter for iPhone 8. Click "Convert" and it will auto convert videos to iPhone 8 & iPhone X friendly format MP4 in a blazing fast speed. Step 4: Click Sync button at the bottom right corner and all the converted videos will transfer to iPhone 8/8 Plus or iPhone X in a flash. It also auto convert and transfer music to iPhone 8 format AAC, MP3. Free download the best free video converter for iPhone 8, MacX Video Converter Pro to convert video of MKV, FLV, WMV, AVI, etc. to iPhone 8/8 Plus/X supported format HEVC, MOV, M4V, MP4 etc. Thus, you can play any video on iPhone 8/8 Plus/X. Should I Switch to iPhone X/8?